The leading Chinese smartphone company has officially launched the Xiaomi Mi 5S Plus specifications along with Mi 5S at the Beijing press release. The Mi 5S plus is bigger in size and higher than the battery power of Mi 5S. 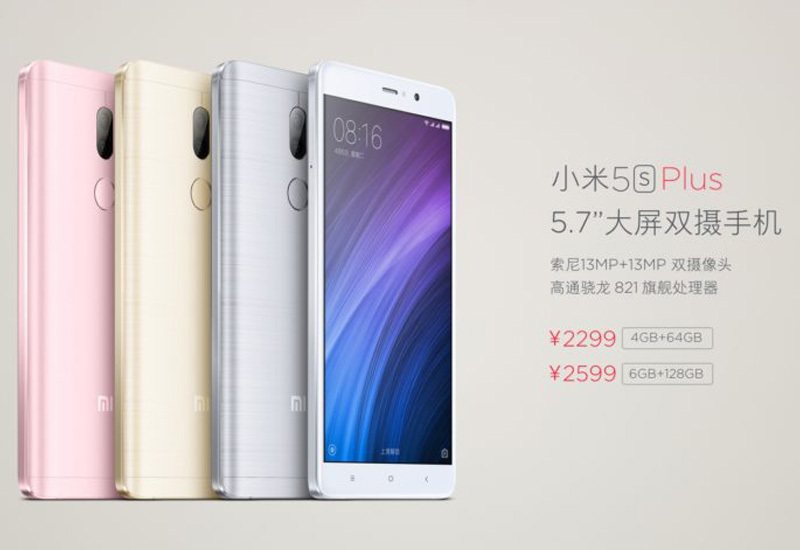 Here, the Xiaomi Mi 5S Plus specifications provided and also, the price tag of the phone. This two variant namely Mi 5S and Mi 5S Plus has also divided into further two divisions based on the memory storage. All the variants will be available in four different colors such as Dark Grey (brushed metal), Gold (brushed metal), Silver (matte), or Pink (matte). The viewers can get the short description about the difference between the Xiaomi Mi 5S and Mi 5S Plus in the previous article. The latest mi 5S Plus will arrive with the 5.7-inch full HD display. The same processor was used for this two variant and it is Qualcomm’s Snapdragon 821 SoC. It will be available in two different storage features. Based on this feature, the price tag has varied. One is made with the 4GB of the RAM with 64GB built-in storage memory. The another one is 6GB of RAM with 128GB built-in memory storage. The camera is one of the most important features among other. Get it here below in this Xiaomi Mi 5S Plus Specifications. It is designed more than one megapixel when to compare with the Mi 5S. Yes, it has the dual 13MP rear cameras with the additional features of Sony IMX 258, RGB and BW sensors, PDAF, Optical Image Stabilization, and dual LED flash. The front-facing selfie camera had made with 4MP as same in Mi 5S. The camera featured with the additional keys as f/2.0 aperture, 80-degree viewing angle. It was made with the smartphone operating system of Android 6.0 Marshmallow with MIUI 8. The phone was made with the non-replaceable battery and it has the power of 3,800 mAh. The Rear mounted fingerprint sensor is one of the special for this latest smartphone. As per the two different variants, the smartphone had the two price tags in its Box based on the Xiaomi Mi 5S Plus Specifications. The lowest RAM of these two, 4GB will arrive at 2,299 CNY. And the another one, highest RAM feature, 6GB will arrive at 2,599 CNY. The latest Chinese Smartphone will roll out from the Tomorrow in China on Thursday, September 29, 2016. The rest of countries release date may out soon by the company.